For other wonderful items, make sure to visit us at our About Me Page. Silver Surfer #63 Art by Ron Lim. 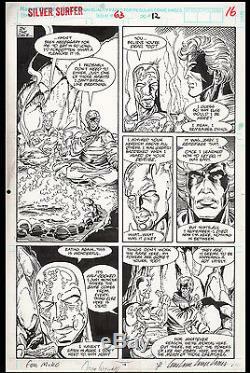 Original art for Silver Surfer Vol. 3 #63 (Marvel Comics, 1992) by Ron Lim (pencils) and Tom Christopher (inks) with Mike Witherby (background inks). From the storyline, "Down Among the Dead, " this cool scene features the Surfer and Captain Marvel as they discuss what it is like to actually be dead. Two key role players in every panel. Art is in excellent condition with image size measuring approx. The item "Silver Surfer #63 Art by Ron Lim Captain Marvel" is in sale since Sunday, August 20, 2017. This item is in the category "Collectibles\Comics\Original Comic Art\Interior Pages". The seller is "water-walker" and is located in San Diego, California. This item can be shipped to North, South, or Latin America, all countries in Europe, Japan, Australia.